You’re in the home stretch of bedtime. Your kids have been bathed. Their teeth are brushed, their jammies are on, and only a bedtime story stands between you and two hours of sweet freedom. You settle down into your kid’s bed, and ask your child to choose the book they want to read tonight. Your child brings you – that book. One of the world’s WORST children’s books. You beg them to choose another- “what about one of the new ones from the library?” or “I’ll read you a whole chapter of Harry Potter!”- but they simply won’t be swayed. You’re going to have to do it. 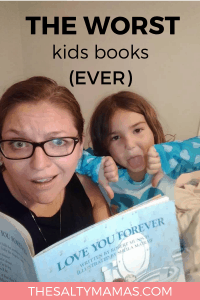 You’re going to have to read a kids’ book that you HATE. And the odds are? It’s one of these six. Read on for the worst children’s books- the ones we simply can’t STAND to read. The world loves this book. It’s supposed to be all sweet and mothery, and make you hold your kids a little tighter and squeeze out a tear or two as you read it. Except I can never get through it without dissolving into full ugly sobs. My kid went from a baby to five years old in about 13 seconds, and it’s only a matter of time until she’s a smelly teenager, and then in a house of her own. I know it’s happening Robert Munsch. You don’t have to rub it in. And can we also talk about how creepy that mom is? She sneaks in his WINDOW? Like, hauls-a-ladder-across-town-level stalker? Am I supposed to think that’s sweet? Cause I LOVE my mom, but if I woke up in the night to her looking at me all wide eyed and rocking me back and forth like an infant, I’d be more likely to call the police than to reminisce about our early years together. These books just.won’t.quit. They are about 76 pages long, and full of words that look like they should rhyme but don’t. I don’t even know how to read that aloud. Calm down there, Seuss. It’s a kids’ book, not the great American novel. I wanted to read my kid a bedtime story, not your thesis on feline misbehavior. And the RETURN of the Cat in the Hat? That’s just rude. I can not decide whether this book is vaguely racist or not. I mean, it’s adorable, but every time I read it out loud I feel like I’m doing a disservice to Mexicans everywhere (which, as I have half-Mexican kids, I do not take lightly). You simply cannot read it without an over-the-top accent (no really- the way it’s written, you just can’t do it). And there’s way too much discussion about frijoles and pinatas for my taste. Stereotype much, Skippy? I mean, it’s the cutest book ever, and the plot is actually hysterical. But it gives me the icks just enough that I’m afraid to read it with another adult within hearing disctance. It’s like these books are setting out to teach some kind of moral value…but then they just don’t. Like, it’s a book about sharing, except he never really shares. And if you have a kid that gets the humor, more power to you. Anytime my daughter starts to pick up a book about a well-loved character, I want to knock it out of her hand immediately. Why do these books have to be SO notoriously bad? Either it’s a rehashing of the movie- I mean, I know the plot already, you don’t need to spell it out for me- or it’s some bizarre offshoot story that makes very little sense. Can we just leave Belle alone with the Beast, for heavens sake? Do we need an entire story about how she lost a thimble? Let’s leave a little mystery and magic to that universe, instead of milking the character for all she’s worth. Worst children’s books EVER. You need to be warned: all of the stories in this book take approximately 46 minutes to read. Where they got “5 Minutes” from is a mystery. And God only knows where they found the writers. Each of the stories has a plot that should take about a paragraph to find it’s resolution. But instead, we get to read eight to ten pages of awkward dialogue and false suspense, only to see our characters end up pretty much right back where they started. So there you have it, the books we would happily bring to bonfire night. What would you add to the list of the worst children’s books of all time? And looking for books that you’ll actually WANT to read? Check out our list of our favorite books to read to our kids here! Spot on with these (I like reading Suess, but more for daytime reading–not for bed time and NEVER The Return of the Cat in the Hat. That one is just awful). May I add any kind of counting book, or ones where you have to make an excessive amount of animal noises? I just…. can’t. There’s also a Sandra Boynton book called “Dogs” which is basically a counting book where you bark the entire time. I had to hide that one under the couch. Loved this. Died at Belle losing her thimble. Also I have questions about why does Little Critter Mom wear elegant dresses around the house but I’ll stop my very long comment here. We need a follow up post from Mother Haggard! I actually haven’t read most of these except Dr. Suess. Yea, even my kids don’t like Cat In The Hat in book form. So far there aren’t any my kids like that I don’t. I’m sure my day will come, though. Fun post! So lucky you haven’t read them… Stay strong, and don’t give in ? Gah! The 5 minute stories have taken 15 years off my life. Apparently when they read these stories in focus groups the kids didn’t have 7 questions per sentence.